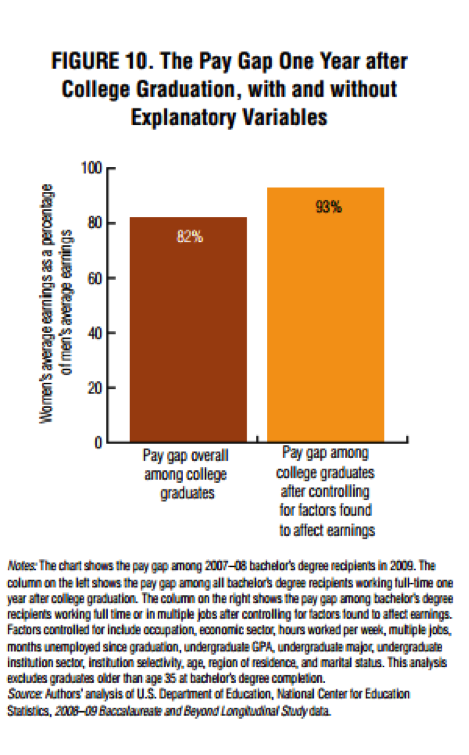 Pay Gap in the IT Community: Myth or Reality | Horizon Technology Partners, Inc.
A study done by the American Association of University Women titled “Graduating to a Pay Gap: The Earnings of Women and Men One Year after College Graduation” (pdf) examined the data of 15,000 graduates to determine if the pay gap could be explained by underlying variables. Regression analysis was used to estimate wage differences in men and women below the age of 35 completing their first bachelor’s degree after controlling the following factors: marital status, whether or not they had children, months employed since graduation, number of jobs held, hours worked, residency, institution attended, grade point average, major, occupation, and economic sector. 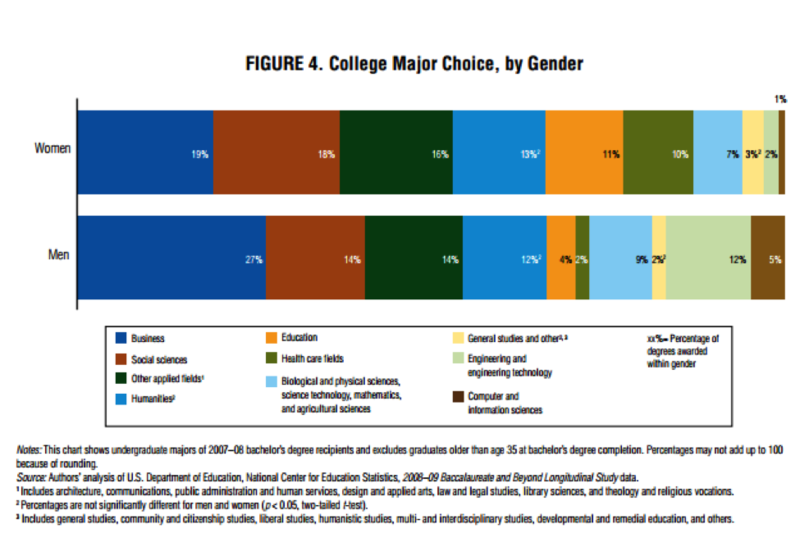 As Figure 4 illustrates, there are more men going into the computer and information sciences, science and math, and engineering. 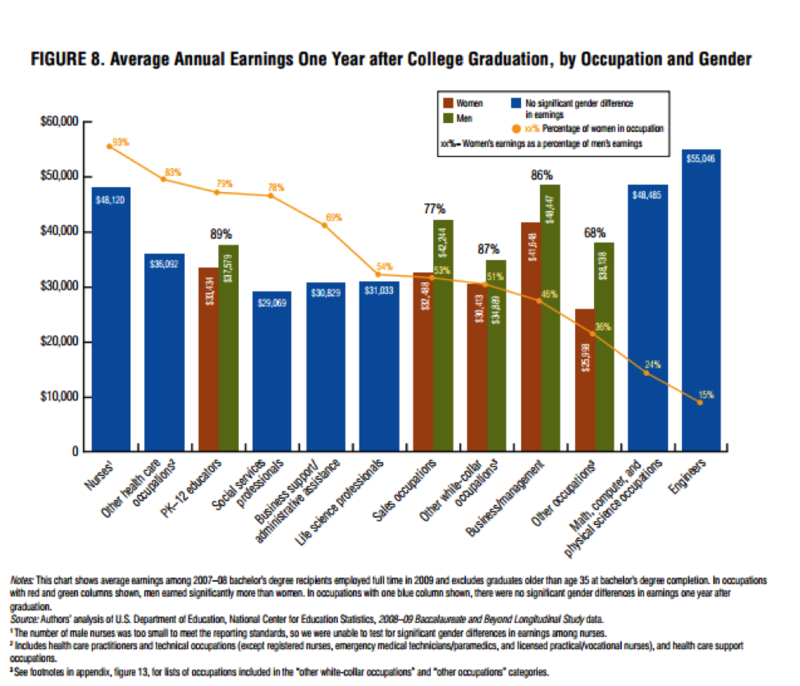 Different college majors result in different earnings and based on the information graduates that held degrees in female dominated areas tended to get paid less than those in male dominated areas which leads to women being disproportionately represented in lower paying job, which with this information alone does not indicate that women are being paid less for the same job. As shown by Figure 8 in certain fields such as health care, biological sciences, social services, administrative assistance, life science, engineering, as well as math, computer and physical science occupations tend to have insignificant differences in earnings. However, in business, sales, and PK-12 educators there are differences from earnings from 68 – 89 percent. Also illustrated in Figure 8 is that although salaries are higher in occupations such as engineering and computer science the women making up this workforce were only 15 – 24 percent. 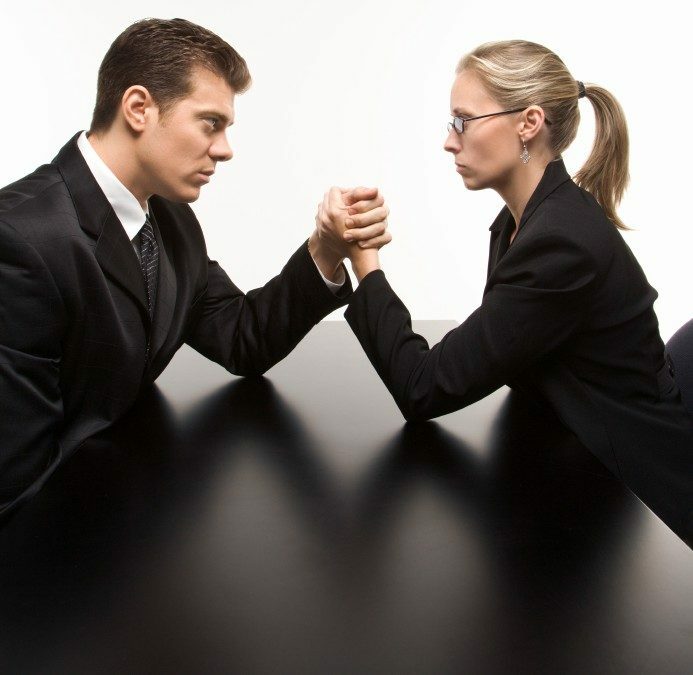 Without any variables examined the pay gap between men and women is an astonishing 18 percent, which in many cases is the statistic used in order to exacerbate the shock factor of the pay gap. Once all known variables are accounted for there is about a 7 percent difference in the annual earnings between men and women with the same major, who attended the same institution, and worked the same hours in the same job in the same economic sector. The pay gap may not simply be a myth. In certain fields it is nonexistent, where-as in others there can be a gap higher than 20 percent. There is still a general perception that women earn less than men do and with this idea in mind it can easily become a deterrent for women hoping to enter the tech world. However, based on the statistics from this study, it’s safe to say that computer sciences may be one of the most advantageous careers for women; not only does it have higher pay in general, there is also no gender discrimination when it comes to pay equality. In the end determining if there really is a pay gap can still be called to question. It is nearly impossible to account for all variables and to supply proof for the allegations given, thus making it impossible to casually draw any conclusions. Based on this study of men and women in nearly identical working environments there does appear to be a tangible gap, but what do you think? Could there be more variables that aren’t being accounted for?